Matthew Bach is an Ironman Champion who experimented by testing his blood to see if he was taking the proper amount of omega-3 fish oil each day. The Zone Labs Cellular Inflammation Test Kit gave him the answers he needed for a perfect score. Instead of guessing whether or not he was taking the right amount of omega-3 fish oil, he tested his blood over time. His results in the lab are as astonishing as his first-place finishes in competition. This is Matt's story. So how do we measure inflammation? A blood test (the Zone Labs Cellular Inflammation Test Kit). I did a blood test before starting the fish oil consumption to measure my AA (Arachidonic Acid) and EPA (Eicosapentaenoic Acid) levels, which are used to calculate the AA/EPA ratio. Dr. Sears' research has concluded that 1.5-3.0 is a good range with 1.5 being ideal. My original test on February 3rd came back at 5.1 (8.96% AA / 1.76% EPA), and after taking 10 capsules per day for a bit less than 3 months, my ratio is now 1.5 (8.2% AA / 5.6% EPA), spot on with the ideal number! I guess Dr. Barry Sears knows what he's talking about when it comes to dosage recommendations! 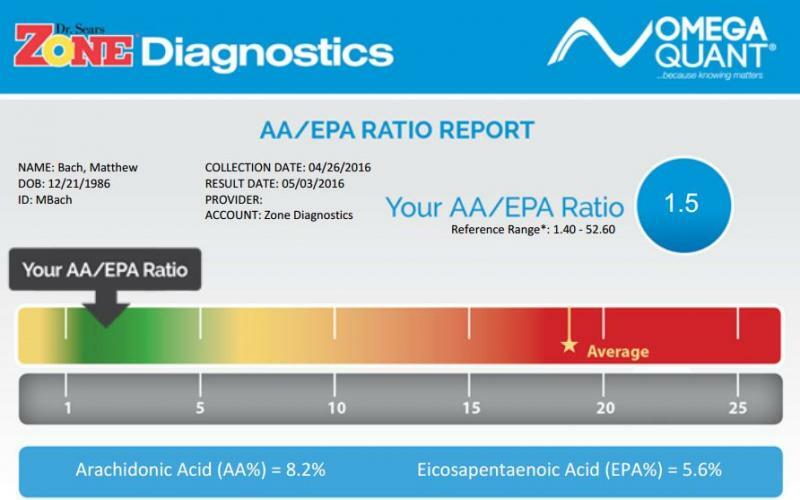 Not only did my second test number reflect a better ratio, but both my AA and my EPA numbers improved, particularly my EPA percentage. The ideal range is >4% of total fatty acids, a number I failed to meet by far in my first test. After taking more fish oil, I've achieved it and then some, meaning I have a lot of "good" fatty acids in my system now. This totally jives with the fact that I've been taking a ton more fish oil under Dr. Barry Sears' guidance, and not just any fish oil, but the highest quality fish oil there is on the market, OmegaRx fish oil. The quick answer is that I've been feeling great! I have been recovering like Wolverine from my workouts, soreness is minimal, I feel sharp-minded, and the symptoms from having low testosterone last year have abated (listen to the recent podcast on Endurance Planet, Episode 2 of "So You Wanna Go Pro?" where I talk about my testosterone issues). How do I feel after taking the proper amount of fish oil? The longer answer is that I've been feeling great, but it's hard to tell that it's directly due to the OmegaRx Fish Oil. There are so many factors in life and in training that could affect my ability to recover, or my testosterone levels, that it's hard to say for certain that it is high dose, high quality fish oil making the impact. However, given the fact that my health has made a turn for the better this year is a good sign that it has been beneficial to me. All of the things that are supposed to improve because of an ideal AA/EPA ratio, have improved. Another way I could try to test whether the fish oil is helping me is by stopping consumption of it and seeing if I feel worse. I don't want to though! There's a good chance that it is helping my health and performance, so I'm going to continue taking it as long as I continue to feel as great as I do. Feel free to comment or message Matt directly if you have stories of your own regarding the impact of fish oil on your health. He's interested to hear, and can be reached on Twitter (@IronMattBach) and Instagram (@IronMattBach).